These TWIG STAR ORNAMENTS are fun for toddlers, preschoolers and older kids to make, and they’re so pretty for such a simple craft. All you need to make them are sticks and some raffia. I have a whole collection of star ornaments on my blog, but these simple twig star ornaments have always been one of my favourite star crafts that the kids have made here in my daycare. 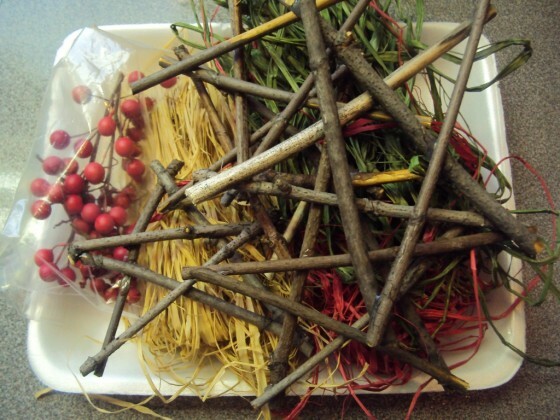 When I’m crafting with the toddlers and preschoolers, we often make our daycare crafts from items found in nature. 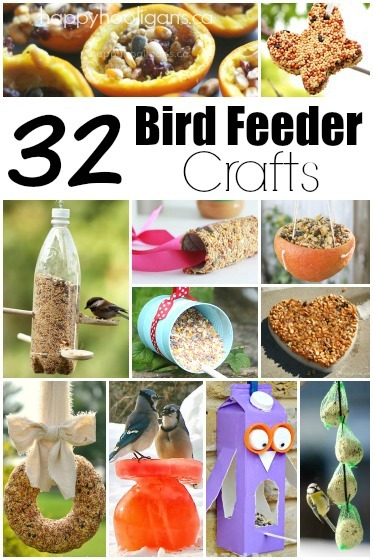 It’s an inexpensive way for us to enjoy crafting and it’s a great excuse to get outside. 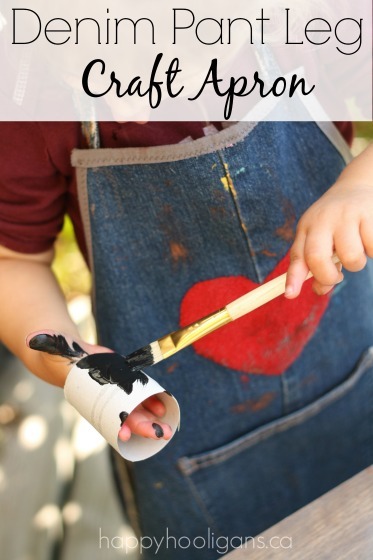 I give the kids a basket or a bag and we head off on a little treasure hunt in the yard or neighbourhood to gather the materials that we’ll be using. 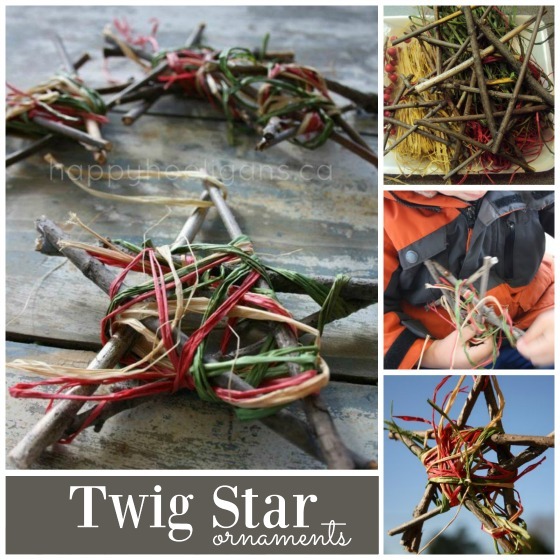 Today we gathered twigs to make these adorable twig star Christmas tree ornaments. The twig star ornaments we ended up making are so simple and rustic, and my goodness, they’re so pretty. It’s amazing to think they were made by toddlers and preschoolers. We’re going to hang our twig star ornaments on our Christmas trees, but they’d look great strung into a garland or displayed on a fireplace mantel. After gathering our sticks, the hooligans played in the yard while I trimmed the twigs so they were all about the same length. With my glue gun, I glued 5 sticks together to form the stars, letting the ends of the twigs over-lap each other a little. Then I gave the hooligans three long strands of raffia: one red, one green and one natural. 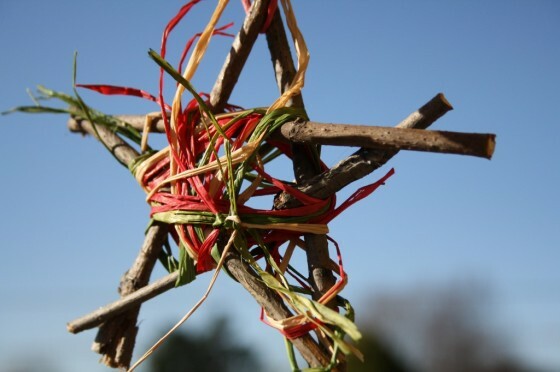 I tied the raffia to the star to secure it in place, and they wrapped and wound it all around the twigs. Wrapping the raffia around the twig stars was a great exercise in co-ordination for the preschoolers. It was challenging holding the star still in one hand while wrapping the raffia around it with the other. Some of the kids wound their raffia quite tightly around the star, and other stars had a much looser look when they were finished. 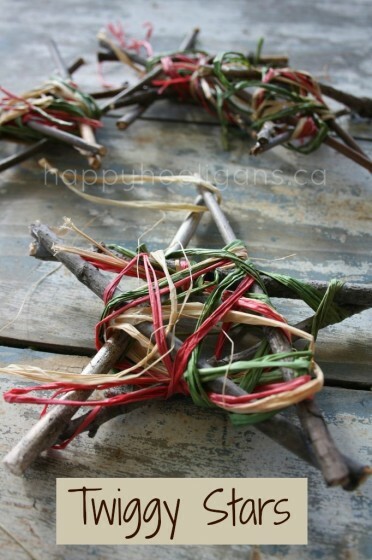 I just love the look of these rustic twig ornaments! I’m getting excited to think of all the different ornaments we can make with twigs this year! 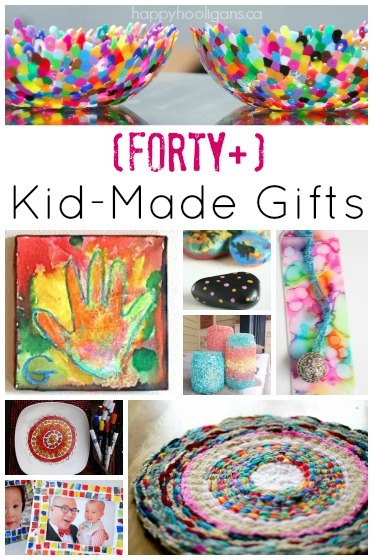 Don’t you just love a kids’ craft that looks this great and costs next to nothing to make? Very pretty. I like this. I love how the kids used raffia to decorate the stars. 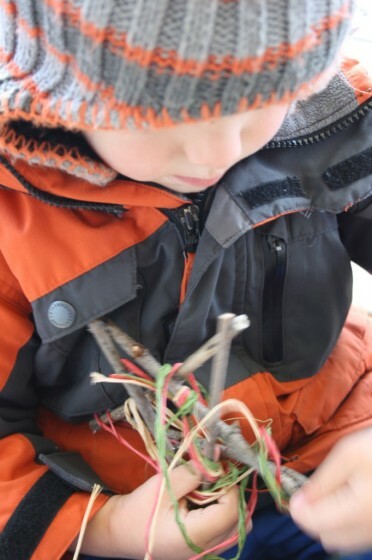 We made twig stars, too, but I wasn’t sure how to have the kids help decorate them! I was kind of stuck on what to use when I was coming up with my plan, and then I ran across the raffia in my cupboard and thought “bingo”! I’d thought of wrapping them with wool, or painting them and gluing jewels on. I actually had some artificial berries to add to them, but didn’t bother because they looked so pretty as is, and I didn’t know how well the jewels would adhere to the sticks. So pretty! I love all your ideas and great photography too! Thanks, Melissa! That’s so sweet! Your photography comment is such a compliment!! I’m taking my first photography class and I’m really enjoying it! Nice to hear my pics are lookin’ good! What a great idea! I really like the natural look. Thank you for sharing. 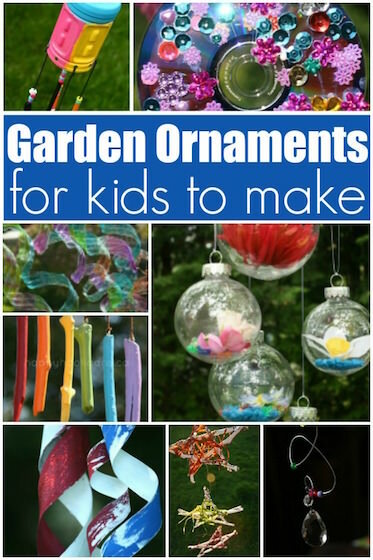 I loved these ornaments and I will definitely make them for Christmas! Awesome idea! 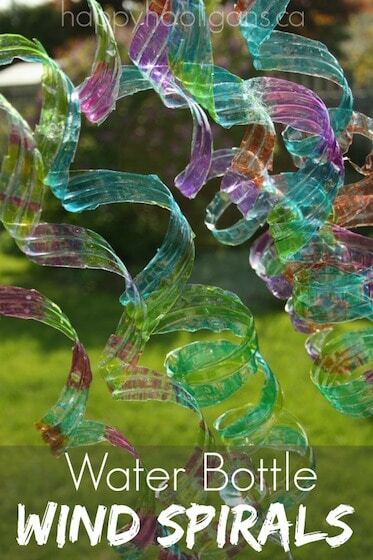 Where did you find the different colored raffia? I only found the natural color. I got a bag of red, green and natural raffia last year, and I think I got it at Michael’s Crafts (in Canada). I was there today, and I saw a bag of about 6 colours, browns and purples and natural, and I saw some individual bags of red and green and natural. I was looking (and crossing my fingers) for a slivery blue today, but no luck. They are so pretty!!! Great gift idea as well. Thank you. Love them! It is now Christmas 2012 and I am trying to make some of your crafts for my tree!! Fun times…….and you are right….these are PRETTY! I have some of the raffia, just need twigs and I’m good! Maybe I’ll throw on some glitter?…….glitter is my best friend this year for some reason…..gettin my bling on I guess! Just love all your crafty suggestions. Thank you so much. Myself and my girls have a ball recreating them at home. You’re so welcome, Mandy! I just love hearing that you’ve been inspired to try something that we’ve done here. And I really love that you get crafty with your girls. Making memories! I love these! The daycare kiddos helped me gather some thin branches the other day and I will be turning them in to starts this weekend. They know there is going to be a project using their sticks, they just don’t know what it is yet and are super excited! just made a whole bunch of these plus some of your twiggy trees – they are so simple and naturally beautiful – thanks for sharing with us! Aren’t they fun to make, Jennifer? I’m so glad you liked them! What a lovely thought, Lea. It makes me smile to to think of our stars making it halfway around the world. Thank you for letting me know! Thank YOU for sharing !!!!! What a GREAT idea ! Love it! so organic 🙂 Thank you for all of your great ideas! My classroom is better because of you! This is really gorgeous! 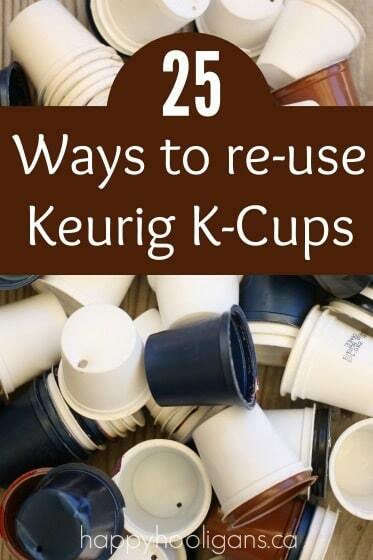 I have pinned it to the Better Homes and Gardens board. These were a huge hit with my four boys (ages 9, 6, 5 & 3). Not only are they going to decorate our own home but will be wonderful additions to family/teacher gifts this holiday season. Thank you for the wonderful ideas. Hi Jackie! I’m going to have my cub scout den make the twiggy stars as a Christmas project for their family Christmas tree this year. I have all the supplies except the twigs. I understand they need to be about the diameter of a pencil but what is a good length? Okay these are sooo cool! I wish I was artistic 🙁 Your sharing are absolutely fantastic. Just loving it. 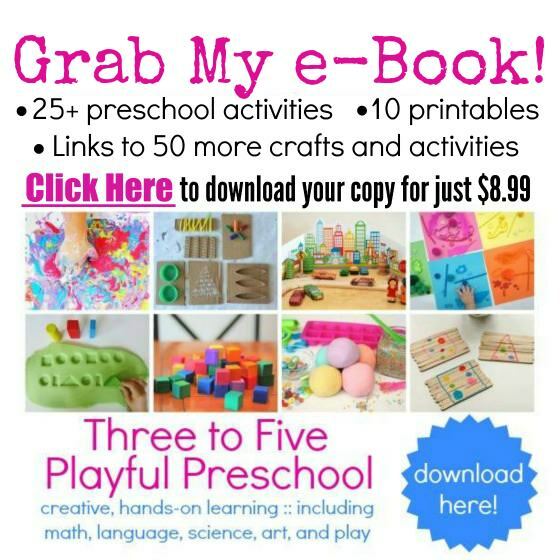 You are doing a wonderful job involving the kids with your simple ideas which is fascinating.